The value of a photo accessory depends in large part on how many ways you can use it. Besides all the things you can do with the device by itself, there are things you can add to it to increase its versatility. Accessories you can easily make yourself with very little time and expense are a definite plus. HandlePod offers several advantages in the Do-It-Yourself category. 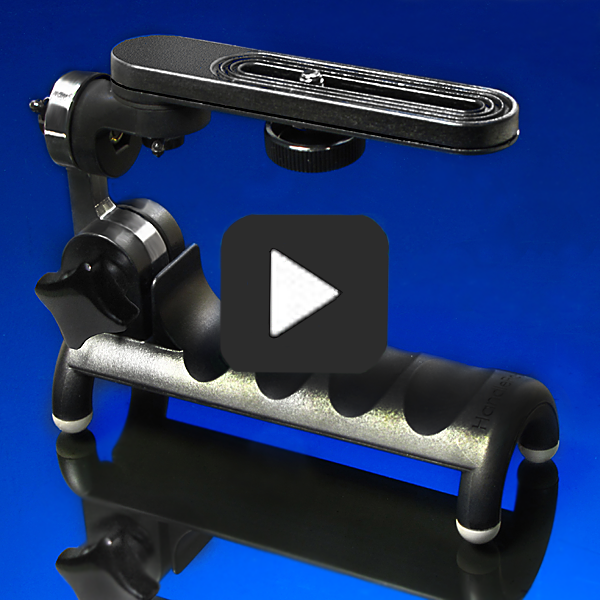 With very little effort or expense you can use HandlePod as a steadicam, a video camera slider or add a sunshade hood to a smartphone or camcorder. Here is a summary of DIY projects for HandlePod with links to more complete articles. A very effective steadicam can be made with a few dollars worth of PVC pipe. The simplest version is balanced and held by hand but works very well. Add a gimbal to make it even more stable. The final touch is adding a roller bearing to completely isolate hand movement from the camera. The HandlePod steadicam will support a small camcorder or even a consumer DSLR for absolutely smooth, stable video. And adjustments on the HandlePod camera mount make it easy to balance any camera precisely on the steadicam. HandlePod video camera slider on a tripod. Commercial sliders can cost hundreds of dollars. But HandlePod can be made to slide effortlessly across any smooth surface just by covering the rubber feet with strips of Velcro. Use a thin length of wood and a yardstick to make a slider to use on any surface or mount on a tripod. It can be set up anywhere and produces smooth tracking shots. The cost is minimal and construction just takes minutes. Sun shade makes smartphone screen easy to see in daylight. The video monitors on camcorders and smartphones work well but are very difficult to see in bright sunlight. By using a Dot Line Smartphone Tripod Mount with HandlePod, you can easily add a simple cardboard shade hood to any size smartphone. This makes the screen much easier to see in daylight and provides a solid grip on the phone for steady, shake-free video. A similar shade for the camcorder monitor can be made in minutes with any thick black paper. HandlePod holds the paper shade in place and also provides a firm handle to minimize camera shake. These DIY projects are simple, inexpensive and greatly enhance the versatility of your camera or smartphone. They can all be done with a few dollars, a few minutes of time and a HandlePod. This entry was posted in Tripod Alternative on May 24, 2015 by main user.